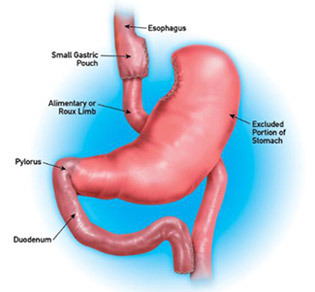 Roux-en-Y bypass is a procedure more commonly known as gastric bypass surgery. In San Francisco and throughout the country, this is the gastric bypass procedure that has been most regularly performed and publicized over the past 20 years. This procedure constructs a small pouch at the top of the stomach to limit meal size, generally to one ounce or less. Approximately 15-20% of the small intestine is bypassed, and a limb of small intestine is joined to the stomach pouch so that digestive enzymes can mix with the food. After 18 months, weight loss can range from 45-75% following this procedure and in many cases is fairly well maintained. For a more detailed comparison of weight loss surgery options, including the duodenal switch procedure and vertical gastrectomy, visit our surgical options compared page. This resource can help you determine which procedure may be right for you. If you would like to find out more about surgical weight loss, click here to request a consultation with Dr. John Rabkin at Pacific Laparoscopy. Or you can call our office at 415-668-3200 to schedule your appointment.